The price of fuel has hit a three-and-a-half-year high as the price of oil continues to climb, putting more pressure on consumers. The average price of petrol has risen to 127.22p a litre and diesel to 129.96p a litre, following a rapid rise in the oil price. Recent figures suggest a squeeze on incomes has begun to ease, with wages growing faster than prices. However, rising fuel prices threaten to prevent inflation slowing. "Things have started to look better for the UK consumer recently, with inflationary pressures easing and real wage growth finally started picking up," said George Salmon, equity analyst at Hargreaves Lansdown. However, he said, that drivers had noticed the impact of higher fuel prices at the pumps. "Filling up the tank is a pretty essential expense for most of us, so the average consumer could find there's a few pounds less in the jar at the end of each month." Earlier this month, government figures indicated wages grew at an annual rate of 2.9% in the three months to March, whereas over the same period the inflation rate was 2.7%. As a result, for the first time in a year, real incomes grew, although they remain lower than they were before the financial crisis. "Official figures show that transport is routinely the single biggest area of household expenditure bar none and in most cases transport equals the car," said Philip Gomm of the RAC Foundation. He said the poorest households tended to be hit hardest because they drive the oldest, least fuel-efficient vehicles. In early 2016, fuel prices dipped almost to the £1 a litre mark as oil went below $30 a barrel. Since then both have risen fairly steadily. This month the price of crude oil briefly reached $80 a barrel and is still at levels not seen since 2014. Last week, the chief executive of French oil company Total, Patrick Pouyanne, said he believed oil could reach $100 "in the coming months". "If the boss of one of the world's largest oil companies is talking about $100 a barrel or more, then you have to think things are going to get worse before they get better," said Mr Gomm, pointing out that prices at the pumps lag behind prices in the wholesale market. However, Ruth Gregory, chief UK economist at Capital Economics said she expected the impact of higher fuel prices on the UK consumer to remain limited. "We're expecting the oil price to drift lower by the end of next year. The recent rise mostly reflects geopolitical tension and the potential risk of supply disruption, factors we think should prove temporary." In the meantime, the overall trend for rising wages would continue she said. "We've seen clear signs of a revival of pay growth in recent figures and we are expecting a further tick up to around 3% towards the end of this year." Alan Clarke, UK economist at Scotiabank, said while filling the tank represents only around 3% of household expenditure on average, fuel price rises could still dent consumer confidence. "The sentiment is important," he said. "You really notice [price rises] for things you buy frequently like petrol and food." 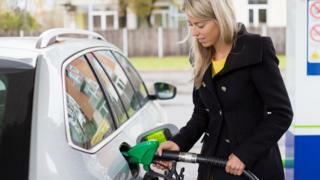 He said by July, petrol and diesel prices were likely to be 14-15% higher than a year earlier. When prices rise for non-discretionary things such as fuel, there is less left for "fun" items such as holidays and eating out, Mr Clarke said. The higher fuel price comes in the wake of higher crude oil prices. The rise has been driven in part by President Trump's announcement that the US would re-impose sanctions on Iran, overturning the deal to curb Iran's nuclear ambitions and raising fears that Iran's energy exports would be affected. Fresh US sanctions against Venezuela after the re-election of socialist leader, Nicolas Maduro, have also pushed the price of oil higher. Despite this, BP chief executive Bob Dudley has said he expects US shale and increased supply from members of oil producers group Opec to make up for lost production elsewhere. He predicted the oil price would return to between $50 and $65 a barrel in the near future.